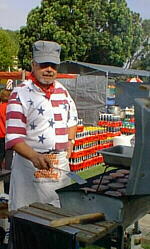 This Santa Maria event was held Saturday, October 6th from 10 a.m. till 4 p.m. in Santa Maria's City Center at Cook and S. McClelland Streets [Yahoo map], just across from the Santa Maria Town Center. 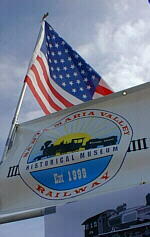 Admission to the festival is free. 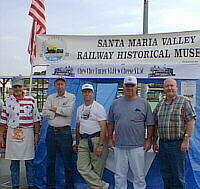 "Chew Choo" Burgers were the bill of fare offered by the SMVRHM! 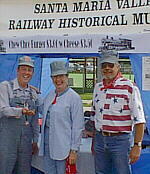 We were pleased at the attention given the poster and flyers for the SMVRHM Bitter Creek Western Live Steam Railroad event scheduled for October 27, 2001. We hope you took the opportunity while in the neighborhood to amble by and take a look at Caboose No. 180 at Jones and S. McClelland. Restoration by the SMVRHM is underway.